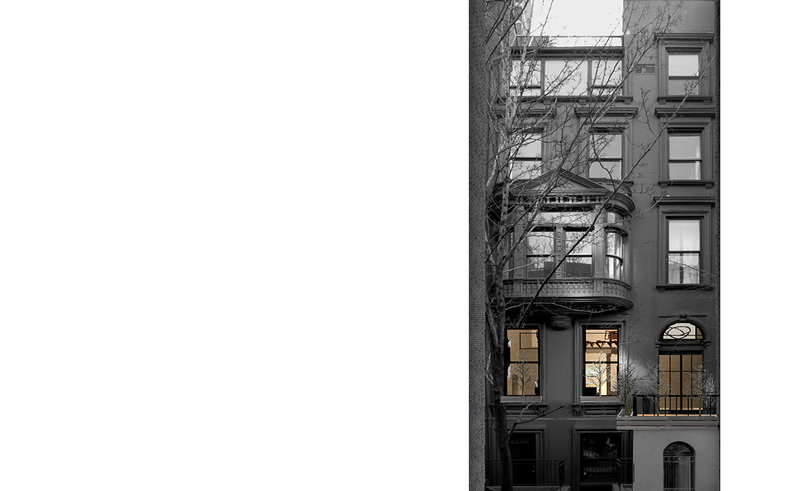 In a brownstone off Fifth Avenue, the understated design an apartment on the grand first floor (the piano nobile with 18 foot high ceilings), accentuates vertical proportions and creates a visual and conceptual counterpoint to the building’s façade. Structural and functional elements—designed in wood, stainless steel and white marble—fashion a rubric of sculptural expressions that imbue the apartment with a tactile modernity. Above a custom designed Thassos marble fireplace, a site-specific commission by the owners of Aharoni’s Lunar Calligraphy series forms a quiet, expressive counterpoint to the precise geometry of the fireplace’s interlocking black and white forms.